In the spirit of the recent posts about eggs, I thought I’d share some things that you can do with the egg shells. My mom always kept a container in her kitchen for used eggshells, and now I do the same thing. Saving the shells takes about two seconds, and it doesn’t cost anything - win win. Plant Food: This is my most common use for the shells. I crush them and put them in the soil of my houseplants and herbs - the shells contain a lot of calcium which is good for the soil. My mom always swore by them for tomatoes especially - a lot of the time blossom end rot is caused by a lack of calcium in the soil, and eggshells can help with that. I don’t have tomato plants (yet), but I figure the shells can’t hurt my soil! People Food: When I make stock, I’ll sometimes grind up a few shells in my coffee grinder until they make a fine powder and add them to the stock. This extra calcium is important in my diet because I don’t get a lot of dairy (Cheese is expensive and yogurt is gross). You could probably use the ground powder in other food as well, but throwing in my stockpot is the only way that I use it. Let me add that when the shells are crushed, it takes a LOT of shells to create an appreciable amount of crushed eggshell, so it’s not unrealistic to save all of your shells, even if you go through a lot of eggs the way that I do. Saving them doesn’t hurt anything, it doesn’t cost anything, and it doesn’t really take much time...so why not add a little calcium to your soil or your food? Wash out all the egg bits. When I clean the breakfast dishes, I just rinse them out with hot water. It literally takes about five seconds. Dry them - I leave the shells in the drying rack with my dishes. They have to be completely dry so they don’t get moldy and gross. Throw them in a container - this takes about two seconds. The container can be closed or open to the air, it doesn't matter. Crush the shells - when you are ready to use them. Or before you want to use them, I guess it doesn’t matter. You can smash them by hand, but they are kind of sharp and I usually wait until I have a ton of empty shells, so I put them in my coffee grinder instead (1 minute). Crushing by hand takes less effort though, and would be fine. Sprinkle the shells in the dirt (or in your stock pot) (1 minute). See? Seriously, why not do that? It helps make your dirt better, and doesn’t take any real effort. Because I am a lovely human being, I decided to spend my evening making mulberry jam for my boyfriend, who is obsessed with mulberries. Yes, those are old spice jars. And an old mayo jar. Sue me, I like reusing stuff. Some background information: Boyfriend is obsessed with mulberries. And I mean OBSESSED. We can't walk by a mulberry tree without him wanting to stop and eat as many as possible, or least as many as he can before I pull him away. Although I enjoy mulberries, I like other summer berries - like raspberries, blueberries, and strawberries - much better, so I don't usually eat a lot of them. But Boyfriend loves mulberries. And I love boyfriend. 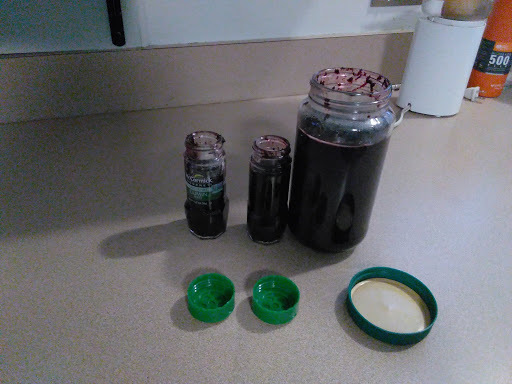 So I decided to go ahead and make him some mulberry preserves for him to have on his pancakes in the winter, during not-mulberry season. But alas, you can't harvest rhubarb until it's 2nd year, so it's sitting in my garden sucking up tons of water and tempting me with it's red stalks that I know I'm not supposed to pick until next summer. 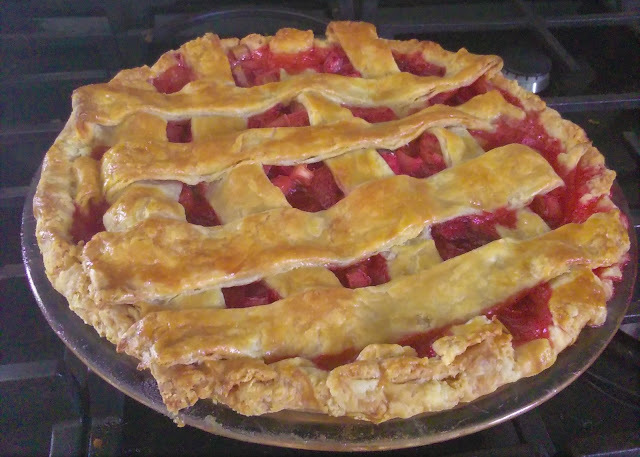 Thankfully, the local farm market was selling big bundles of rhubarb this past Saturday. Not so thankfully, when I called my mom for the rhubarb cobbler recipe, she informed me that my Grandma hadn't written it down and so - since my Grandma is long passed away - it was lost in family history...which explained why I didn't remember having it since I was a child. Today, I embraced the rain. Today, Boyfriend and I decided that we were going to go blueberry picking. It was an overcast day with scattered showers, making it a poor day to go hiking, swimming, fishing, or any of our other usual summer weekend activities. We didn’t think we were going to get a chance to pick blueberries this year, and figured that since our hiking plans were a wash (pun intended), we would try to fit in a visit to a blueberry farm and a to see my parents, who live out in the country where all the good things in the world, like blueberry farms, reside. In the News - Peanut Allergy Cure?